SIPRI published a new report, Mapping the Development of Autonomy in Weapon Systems, which aims to shed light on the current developments in autonomy in weapon systems. The report provides important insights for informed international discussions. To launch the report, SIPRI hosted a side event at the United Nations in Geneva to discuss the findings at the meeting of the Group of Governmental Experts of the Convention on Certain Conventional Weapons (CCW) on Lethal Autonomous Weapons Systems (LAWS). SIPRI launched the new Background Paper ‘3D printing and missile technology controls’, originally part of a compendium of research papers compiled by the Missile Technology Control Regime on the occasion of its 30th anniversary. Dr Jaïr van der Lijn, Head of the SIPRI Peace Operations and Conflict Management Programme, was featured on a panel discussion on peacekeeping arrangements between intergovernmental organizations at the recent Dakar International Forum on Peace and Security in Africa. SIPRI and the Friedrich-Ebert-Stiftung (FES) will continue their cooperation on researching China’s Belt and Road Initiative (BRI) from a security perspective. A policy report culminating the research will be published next year. While the work will concentrate on the EU’s foreign and security interests, it will be of interest to all Maritime Silk Road stakeholders. This 48th edition of the Yearbook follows the volume’s esteemed tradition of identifying and analysing the current trends relating to armaments and disarmament. 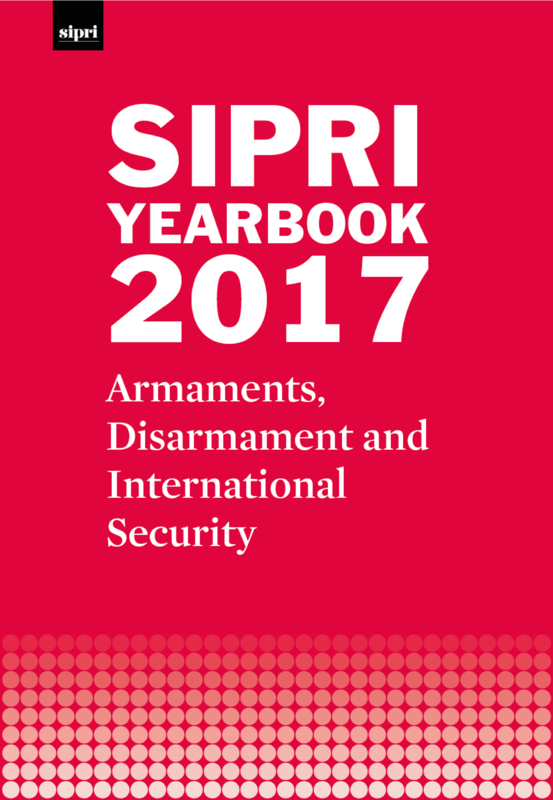 SIPRI is pleased to make available free sample chapters, as well as Yearbook summary translations in Catalan, Dutch, English, French, German, Italian, Spanish and Swedish. In honour of the International Day for the Elimination of Violence against Women, this blog makes recommendations for analysts and policymakers across the field of development and peace. North Korea and the USA: Are there ways out? Dan Smith gives his take on the current situation in North Korea, suggesting where there could be opportunities for setting up a reasonable security relationship with states in North East Asia. SIPRI, together with the Swedish Ministry for Foreign Affairs and the Stockholm Resilience Centre will host a high level seminar to reflect on strategies to address climate-related security challenges. SIPRI will hold a roundtable discussion based on the release of a new report on the security implications of China’s Belt and Road Initiative. SIPRI will launch the Arabic translation of the SIPRI Yearbook in Alexandria, Egypt, in cooperation with the Swedish Institute of Alexandria. The edition was made possible by the work of SIPRI’s translation partner, the Centre for Arab Unity Studies (CAUS) of Beirut. For further details, please contact Alexandra Manolache, SIPRI Communications Officer (alexandra.manolache@sipri.org). SIPRI hosted a discussion on water crisis and its implications for a conflict-ridden Middle East and North Africa. The event featured a keynote speech from Dr Francesca de Chatel. In cooperation with the Finnish Embassy, SIPRI hosted a roundtable featuring a keynote address from Ambassador Klaus Korhonen of Finland, who served as the president of the ATT Third Conference of States Parties. The informal discussion explored the current state of conventional arms control. For further details, please contact Mark Bromley, Co-Director of the SIPRI Dual-Use and Arms Trade Control Programme (bromley@sipri.org). SIPRI and the US National Defense University co-hosted the European launch of the new book Effective, Legitimate, Secure: Insights for Defense Institution Building. Dr Gary Milante, Director of SIPRI's Peace and Development Programme—who contributed to the volume—provided insights related to the book's coverage of the development sector. This report presents the key findings and recommendations from a one-year mapping study on the development of autonomy in weapon systems. The report aims to help diplomats and members of civil society interested in the issue of lethal autonomous weapons systems (LAWS) to improve their understanding of the technological foundations of autonomy, and obtain a sense of the speed and trajectory of progress of autonomy in weapon systems. Additive manufacturing (AM), also referred to as ‘3D printing’, is a rapidly developing technology. This SIPRI Background Paper takes stock of the current state of the art of the technology by explaining its basic features and by highlighting the level of maturity and spread of AM applications in the aerospace sector. Building on this review, it discusses the specific challenges that AM poses to export controls by examining existing controls and proposals for new controls on transfers of AM machines, feedstock materials and digital build files. The report also proposes potential ways forward for the Missile Technology Control Regime (MTCR) and the other multilateral export control regimes, for national export control authorities and for companies involved in AM.